In both PR and SEO, content is the major component of everyday work. In PR, it usually takes the form of press releases and constitutes a source of information and promotion, and is a way to build media relations. In SEO, however, with proper optimization, content enables websites to develop better online visibility by responding to user search queries. Since content plays such an important role in both types of activities, why not join forces and start crafting content that will not only attracts media’s attention but will also create an opportunity to rank high in search results? It’s certainly well worth it. But where do I even start? Planning: How to Schedule Content? First, it’s critical to schedule all your writing and publishing activities. This is where creating the right strategy for your actions and an event calendar can help you. As far as with some typically seasonal products like Holiday decorations or First Communion shoes it is pretty obvious when to write articles and news releases on these subjects, it is perhaps less evident in the case of crafting content about stuff that is not tightly related to a given season or a particular time of the year. Matching your content to the right moment to satisfy the users’ interests may contribute to getting your content marketing efforts more attractive and bringing significant success—e.g., in terms of sales results or image—to your company. 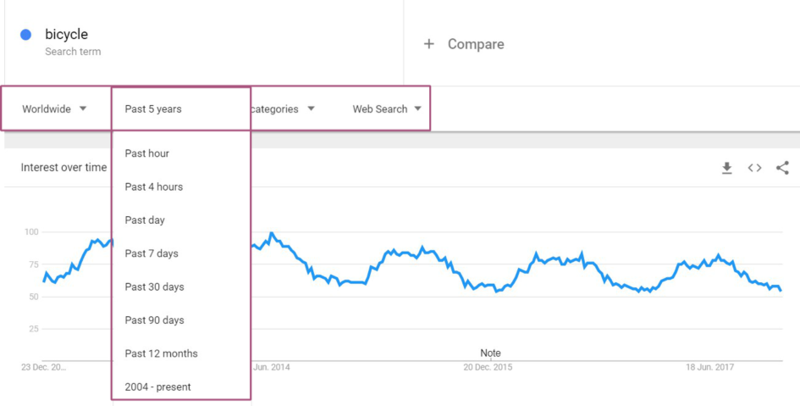 To learn when users are most willing to search for specific content online, it’s worth to try Google’s free tool—Google Trends. By entering certain search-phrases, you can learn, for instance, at which time of the year users most often search for a particular term or how popular a specific trend is (values 0–100). When looking for a particular query, you may select, among other things, the location, which is the country in which you’re interested with regard to a particular subject, and you can specify the time range. It’s possible to check the last hours and days (however, this solution is recommended if you wish to track the latest trends), but you should also analyze query trends for the last year or five, or mark some other timeframe of our liking. 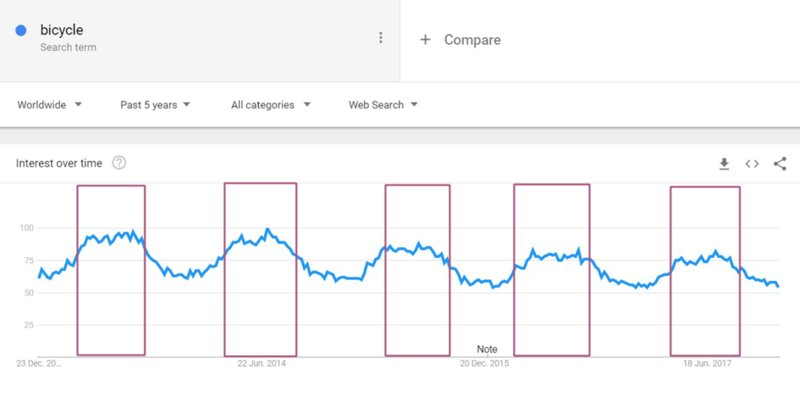 For example, the above chart shows you how and when users search for the term “bicycle.” Here, the time range selected is five years, to illustrate whether there is any correlation between the queries and seasons of the year and to see if the general trend is growing, remains stable, or is downward. You can see from the chart that the popularity of the search-term “bicycle” each year increases regularly—between end-March to end-August. This gives you information as to when to write articles on bicycles to make sure they’re most attractive and popular among users. Another useful functionality of this tool are suggestions concerning what other related phrases are searched in Google. Viewing such similar queries may serve as inspiration for you—you can learn what to include in your piece and what issues to refer to, to make your article even more compelling. Yet another feature of this tool is the possibility of comparing several queries. Here, I’m testing the phrases “bicycle” and “motorcycle” that have been searched for in the last five years. 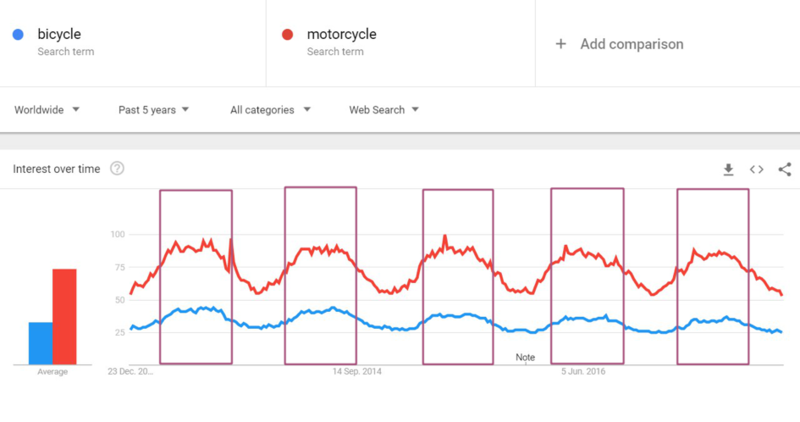 As you can see, the search-term “motorcycle” is more popular, and it has most search volume between mid-March and end-August. What’s more, the charts show that the popularity of searches for motorcycle-related topics decreases each year. Based on this, you can research some other topics to start writing about in order to fit into the current trends related to bicycles and motorcycles. With data provided by Google Trends, you can learn what topics will be attractive for your online audiences within a specific timeframe and think how to use these in the marketing activities you intend to carry out (press releases, social media actions, advertisements). It’s also worth to think whether there are some events which could be used to modify the planned content in a way to match the topics that are most searched for by users at a given moment in time. Before I move on to describing how the Keyword Planner works, I’d like to emphasize one aspect that I consider to be crucial in the process of crafting content. If you’d like to create information that will not only be interesting with regard to its content itself but also optimized in a way to strengthen the visibility of your website, I recommend taking into consideration what users are really searching for. As it frequently turns out, the queries that we think are very popular, are in fact far less often typed into Google search box than some other, similar phrases. To get to know what users are really looking for, another tool developed by Google will be of much help here—Keyword Planner. Keyword Planner is also offered for free. Their only condition is that you’ll need a Google account if you want to use it. This tool is extremely helpful in every SEO specialist everyday work, when optimizing content on websites and web pages, so it matches the highest possible number of user queries. In the box “Your product or service” type in the key phrases that you would like to use when writing your piece. In this case, I entered “bicycle,” “motorbike” and “motorcycle”—so I already know the time range when the topic is the most trending; now, I can find out which phrases are most frequently searched for. Additionally, you can use Targeting to select the country for which you want to check the popularity of particular search-phrases and language—this may be helpful if you’re writing in another language and your piece will be published on a foreign website. With this function, you can check the popularity of search-terms in other countries. After you get the results for the phrases you’re interested in, a panel will display to show you information related to the popularity of these phrases (average monthly searches), and, at the top, you’ll see a chart showing search volume trends. With this, you will be able to find out which phrases are the most popular and on which it would be best to focus when crafting your content. 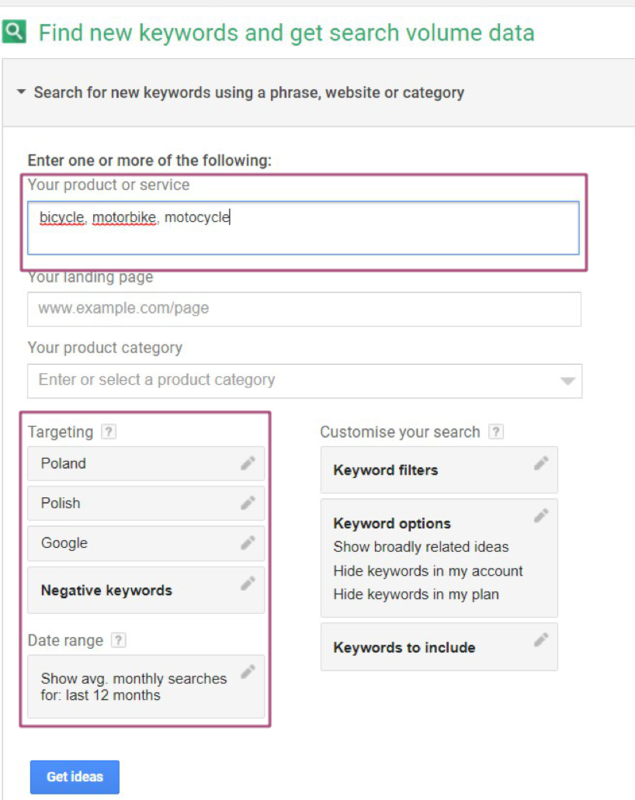 Another feature offered by Keyword Planner is the option to show other relevant keyword suggestions as to which phrases that are similar to our search-terms are the most popular among users. Below your list of search-terms, you will also get a list of phrases that are thematically related to those you typed in. With such data at hand, you can think what other keywords or phrases to include in your content in order to better search engine optimize your articles. Next to the suggested phrases, you will see the average number of searches. The higher the value, the more popular and more often searched for will the phrase be. It also means the phrase is more competitive and it will be more difficult for your website to get to the top 10 Google results. When optimizing press releases and selecting the right keywords, it is worth to consider in response to which terms or phrases you’d want your website to be showing up in search results. It’s good to be aware of the fact that there are two types of keywords: general and long-tail. General keywords are 1 or two words that refer to some very general concepts. These “head” terms are usually very popular, so they can generate more traffic. However, that’s not always the case, as when you optimize for general keywords, you don’t know for sure what the user is looking for and even if your website ranks high in the search results for some general keyword, you can’t be certain whether he or she will be interested in your website and not someone else’s, simply because you don’t know their intentions. Long-tail keywords are those more specific three or four-word keyword phrases, meaning they’re much more detailed. On the one hand, these are the phrases that are less popular, BUT, also, if the user is searching for a specific phrase, this means he or she knows exactly what they need and if they land on your page, chances are you will be able to answer all their questions and needs. 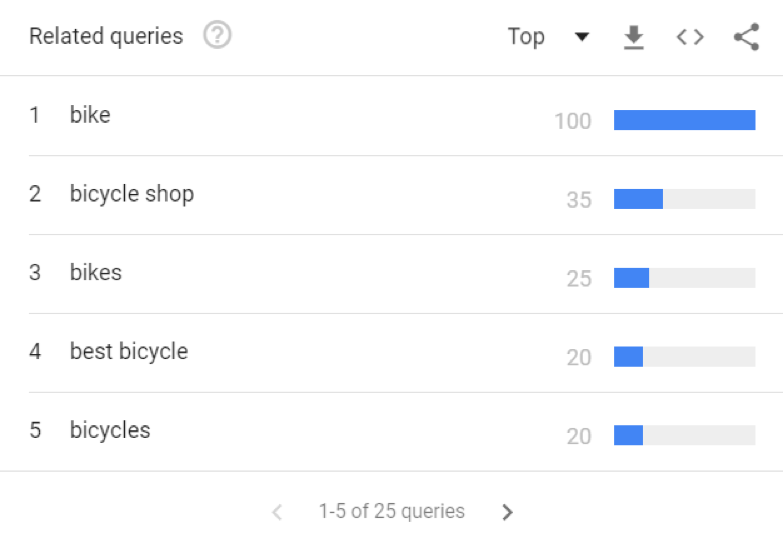 For example, let’s see the keyword phrases that are related to the already mentioned term “bike.” As you can see, the keyword “bike” is very popular, and it is a very general keyword phrase. 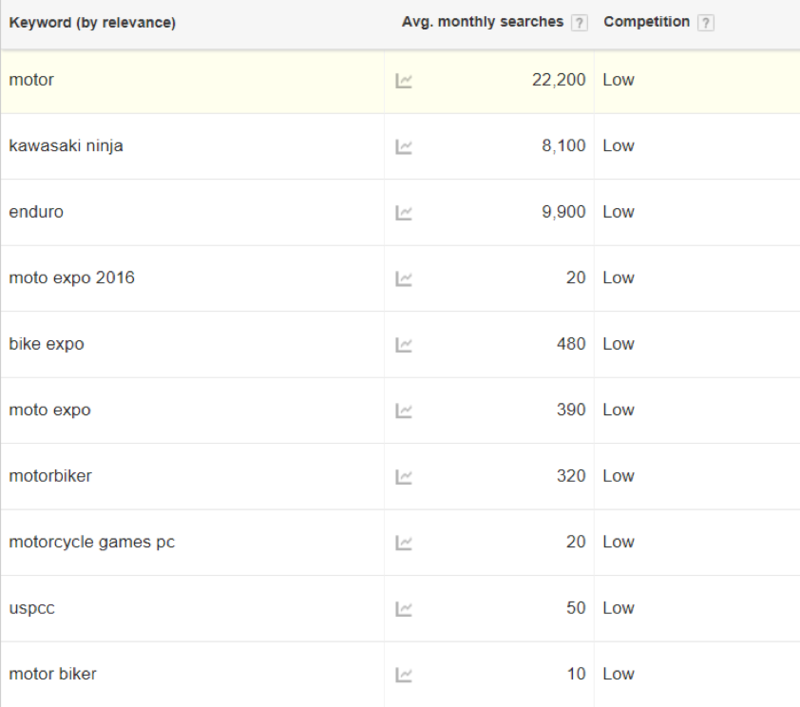 The table below shows examples of phrases that specify this search term (e.g., bike types and for whom these bikes may be intended). The popularity of long-tail keywords is smaller but more specific, which gives you the possibility of directly targeting the exact problem or query the user may have. 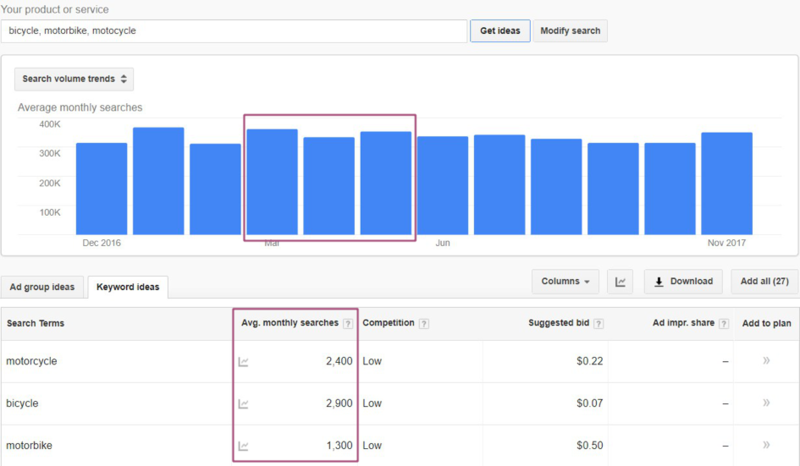 So here’s where the difference between crafting PR and SEO content becomes visible. In the case of PR, content is usually scheduled according to a specific time of the year, e.g., press releases on Christmas-related matters are written and sent out at end-November or in early December, while articles on First Communion trends—in April and May. The situation is somewhat different in the case of SEO. You must bear in mind that optimization activities are long-term measures, so sometimes you must wait for months to get results. If you want to write a blog post on First Communion shoes, and you want your website to rank high in Google search results, for instance, in response to the query: “what kind of shoes do I wear at First Communion,” SEO-wise, it’s important to write and publish the piece a few months earlier. This way, your piece of writing on First Communion shoes (with proper optimization) will get the chance to show up in Google top searches in response to specific keyword phrases. What Else Should I Know About Content? One final word of advice. Google is very sensitive to duplicate content, which means it cares whether a given piece of writing is duplicated on various websites. Google appreciates valuable, but also unique content. A confirmation of the validity of this element, from G’s perspective, is the development and revision of the Panda algorithm, which evaluates websites based on the quality of content and its uniqueness. In the case of sending out press releases, it would be difficult to send a separate one to each website address you have on your mailing list. However, try to avoid duplicating content that’s published on your website with content published on external sites. One possible solution is to write two versions of press releases—one to be published on your website and the other to be sent out to the media. And while you’re at it, you can start creating and publishing website content bearing in mind the above tips on planning and writing articles, which can affect not only your efforts to build brand awareness and expert image but also the visibility of your website in organic search results. Do you want to maximize the efficiency of your PR campaigns and professionally measure and analyze the content that you’re creating? • monitor the effects of your work.